Sissy looked down and she was shocked to find out her ribbon was not there. “Really,” said Sissy, feeling a bit better. “How do we replace our ribbons?” asked Sissy. Mommy took Sissy to an outdoor flea market. Sissy was ecstatic when she saw all the different coloured ribbons. “I don’t think I have ever seen so many colours,” said Sissy. Mommy pointed to another rack behind her with even more colours of ribbon. Sissy was in heaven. “That is going to take some twice,” said Sissy. “Time is one thing we have lots of,” said Mommy. “That is true,” said Sissy. After about an hour, Sissy had picked out two colours. One was a blush pink and the other was a bright burgandy. “I can’t decide between these two,” said Sissy. “I don’t see why not,” said Mommy, paying for the ribbons. “Daddy and Baby probably need new ribbons too,” said Mommy. Things like ribbon, can be replaced. Example: Sissy Balloon was upset when she noticed her ribbon was missing. 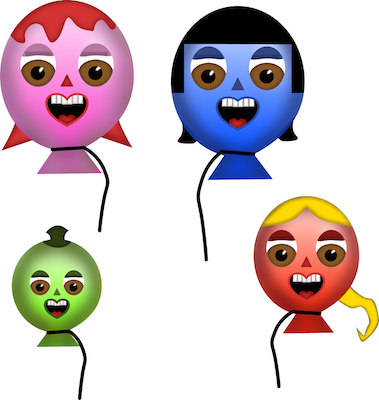 This entry was posted in Fun and Colourful Story Challenge 2017, Happy Balloon Family Stories and tagged best, colourful ribbon, happy, Happy Balloon Family, ribbon, The Happy Balloon Family and the Colourful Ribbon, worry. Bookmark the permalink.